When one dreams of roadtrips with one’s spouse and love crush, they think, perhaps, of wineries, quaint bed and breakfasts, but rarely, gigantic, butchered pigs. But, when married to a chef, roadtrips to acquire 300 pounds of pork is part of the… romance isn’t the right word… partnership, maybe, is more accurate for that side of our particular marriage. Following the great blizzard of 2014 that brought with it many rounds of Yahtzee, an evening of champagne and Wii competition (bowling and MarioKart, of course), card games and lots of 30 Rock, a daytrip out of town sounded magical. But the ride back to Charlotte with two plastic tubs full of pig carcass, and a clock that read much too early for a wine tasting along the way, was, well, not quite what I had in mind. Nonetheless, we made friends as drivers-by would gaze with mouths agape through our windows at the cloven hooves sticking straight up in the air, and we struck up a lively conversation in the parking lot of a Statesville Chick-Fil-A. Yes, the good life. Pork fat or champagne, friends… the Areys have it all. 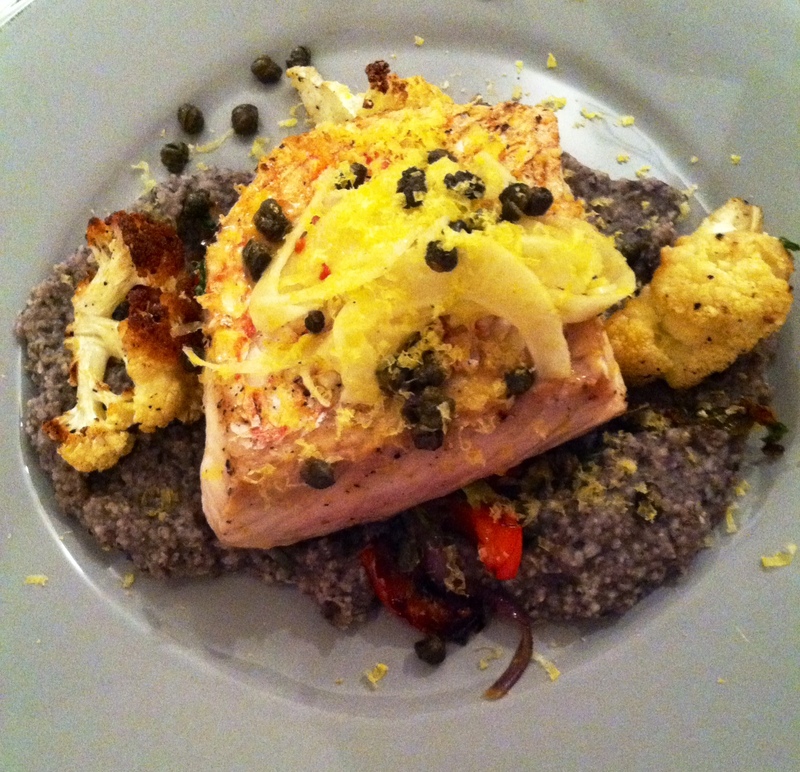 When Davey the Hubbers has a night off, he likes to use our home kitchen as a playground, and last night, we feasted on red snapper with fennel slaw, pan fried capers, cured egg yolks, roasted cauliflower and sauteed peppers all resting atop of the star of the show: black bean porridge. The “porridge” title in and of itself, immediately spoke to my days playing the morose make-believe game “Orphans,” pretending everything edible was gruel (or “grool,” are you a Mean Girls fan). This was an exquisite piece of the meal, and once cooled could be cut like polenta and pan fried, or served warm simply as a breakfast dish topped with an egg. The possibilities are endless, and the high yield of the recipe ensures plenty of experimentation time. Puree black beans in blender or food processor. Combine black bean puree and grits in a large Dutch oven. Add jalapeno (quartering the tip will ensure that flavor is imparted to the mixture). Slowly add chicken stock 1/2 cup at a time, stirring frequently. Continue cooking and adding stock until grits are tender and mixture resembles porridge. Salt and pepper to taste. Finish with a dash of chili flakes. If desired, stir in minced garlic or add butter for extra creaminess).